Are you still not on the structured data bandwagon? Unfortunately, that could be having more of a negative effect on your SEO than you may realize as Google and the other major search engines are relying on this microdata more and more for ranking purposes. But don’t worry, there’s still time to jump onboard and get an advantage over your competition. Below, we’ll explain what structured data is, why you need it, and a no-fuss way to include it in your HTML. In the past, when you’d publish content online you wouldn’t worry so much about how the HTML was coded but focus more on how the information rendered in a browser (i.e. how it looked to humans). The only problem with that approach is it leaves search engines largely out of the loop. Without added, explanatory details in the HTML, search engines may have a hard time making sense of the data and picking out the important parts (at least all of the important parts). And, of course, any lack of communication between your site and search engines is bad for SEO. The answer to this dilemma was found in structured data. Put simply, structured data adds values and attributes to HTML to make it more understandable to search engines while still keeping it viewer-friendly for people. What Format of Structured Data Should You Use? Structured data is not a new concept, and like many things that exist for long in the tech world, multiple formats have evolved. How do you know which version to choose? Well, search engines have made the decision a little easier for you as the major ones (Bing, Google, and Yahoo) are all backing Schema.org. Yes, other data formats like RDFa and Microformats are still acceptable, but wouldn’t you rather be on the side of search engines and working towards standardization? Overall, the search engines’ unification on Schema.org, and Google’s addition of a Structured Data Dashboard make it evident microdata is having more of an influence on rankings. Let’s say you’re posting a review for a hamburger restaurant called “Bubba’s” and you use the word “Bubba’s” in the heading one position. Human readers can tell from context clues your page is about a restaurant; however, search engines aren’t quite as intelligent about deciphering text and may be unsure if you’re referring to a person’s name, a business, a hamburger restaurant, or something entirely different. Schema.org helps to clear everything up through a collection of schemas (HTML tags) that provide webmasters with common vocabulary and microdata they can use to markup their HTML. They have structured data for virtually everything you can think of, and when you add it to your code, search engines can better understand, categorize, and list your site. So, in the Bubba’s example, you could include a tag that tells search engines your content is specifically a review about a restaurant, and you can even add more tags to highlight other pertinent information. Besides reviews, some of the other commonly used schemas are person, product, event, organization, movie, and book. All of this may sound a bit complicated, but the bottom line is — if you use structured data (particularly Schema.org’s), search engines are going to know much more about your site. That equates to better rankings, a more targeted audience, and, consequently, a higher click through rate. When discussing the benefits of structured format, you can’t forget about Google’s Rich Snippets. If you’re an SEO, Rich Snippets should be your best friend, yet if by some chance you haven’t heard of them, they are the small sample of your site’s content (the snippet of information) Google displays under your listing in search results. They are meant to provide a quick summary of your pages so searchers can easily decide if they want to click through or not. However (and this is a big one), Google decides what’s important to display by reading markup tags (structured data) in the HTML. 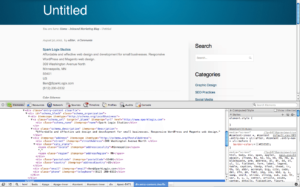 So, if you’re not using microdata in your HTML, how can search engines provide users with an accurate snippet? Although Rich Snippets won’t improve your rankings directly, they do increase click through rates by providing users with better, more eye-catching information. Unlike a plain description, Rich Snippets can include asterisks, rating stars, photos, prices, products, and more, all of which helps your listing stand out from the competition. So, now that you know all about structured data… how can you start using it? Well, you could go to the Schema.org website, peruse the entire schema set (it’s long), and learn how to do it by hand. Or, you can take the easy route and use Raven’s Schema Creator tool. But, for WordPress users, there’s an even simpler solution — Raven’s Schema Creator WordPress plugin. The plugin is super easy to use; just download it from the WordPress website, activate it for your site, and it’s ready to go. You will find the “SC” (Schema Creator) button right beside the “Add Media” button, which is above the text editor in WordPress. 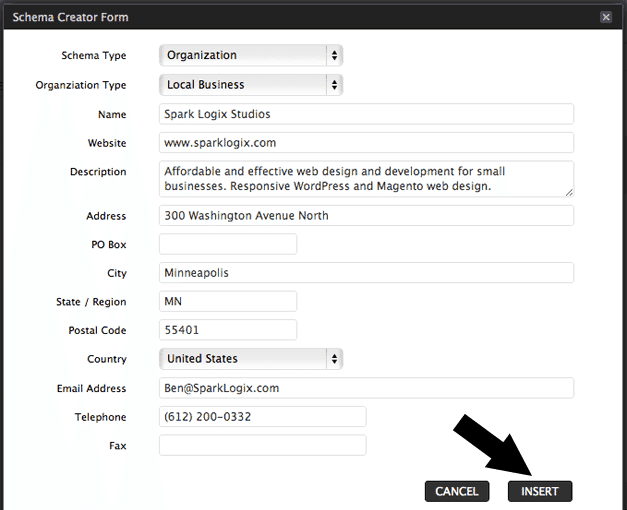 Once you click on the button, adding the microdata is as straightforward as filling out a form. The Schema Creator plugin already has the major schema types listed for your selection and has input fields for all other valuable info. There are sub-categories for each type which appear after you make your selection. Next, fill out the form fields and click insert (you may leave fields blank if you wish). What’s really handy about the plugin is it uses WordPress shortcode, which means you can edit your schema without starting over, and it prevents your microdata from breaking if you decide to edit a page or post in visual mode. Naturally, it’s good practice to learn how to format schemas on your own, so you have an understanding of the process. But, after that, the plugin can speed up the work and ensure you get the perfect format every time. 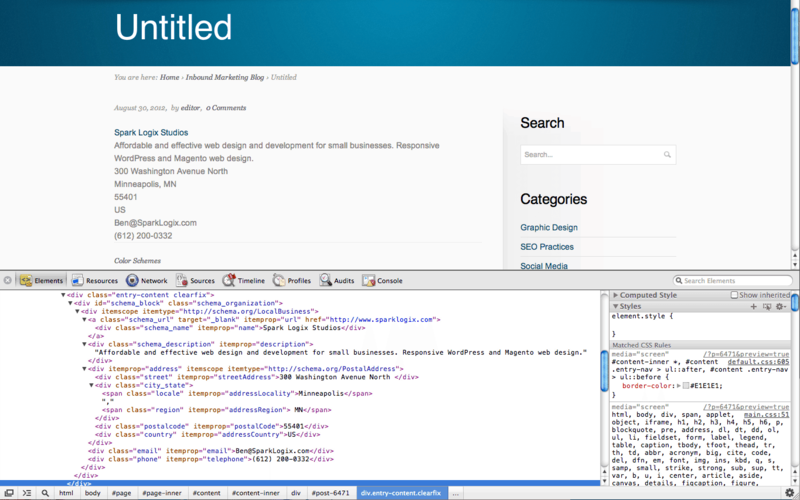 You can simply edit the information in the short code without having to sort through the html microdata. Whether you choose to use Raven’s plugin or not, the vital thing is not to ignore the importance of including structured data in your HTML. It’s a valuable communication tool used between your site and search engines which has a major influence in how, where, and to whom your listings appear. thanks for information actually i am new bie to such structured data things which i needed for good ranking of my blog. Thank you for the detail report on schema creator.